Summary: Oil painting showing an elderly lady sat in an interior. 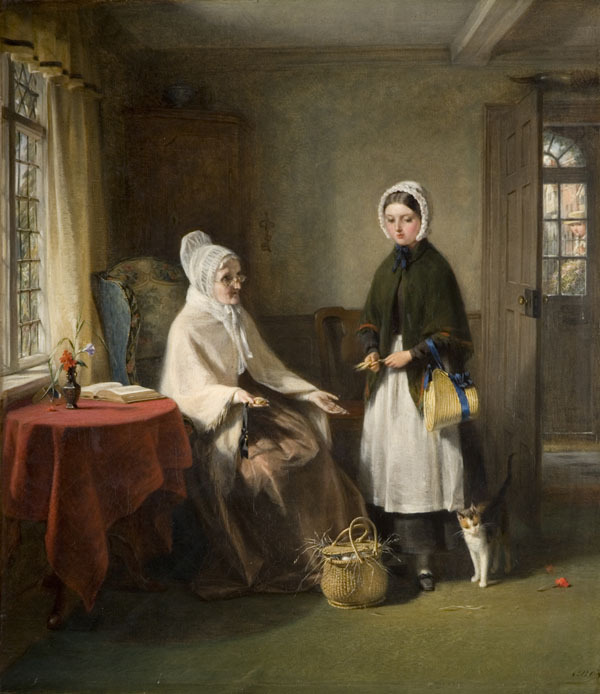 A young woman stands before her looking solemn as the elderly lady reprimands her. A young man is peering through the front door. Description: The young girl in this picture has been delayed, whilst running an errand for her elderly employer. The reason for her tardiness, a young beau, is visible in the doorway. O'Neill described this painting as 'no.2' on the reverse, which suggests that it is a replica of another painting, although no other version has been found. Description: Here, a young lady is being reprimanded by an elder. A rose lies fallen on the floor suggesting an illicit love affair or secret courtship. 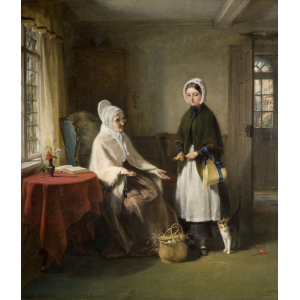 A cat, often a symbol of feminine sexuality and independence, sits at her feet mimicking the girl's solemn face and gaze towards the floor. If we look through the open door behind her, we catch a glimpse of a young man peering through the window. O'Neill specialised in painting genre scenes that were very popular with contemporary Victorian audiences. His works were often sentimental and usually set in pastoral or rural settings. Description: Visually, The Reproof is quite a flat painting. This may be the result of the work being, as the description on the back implies, a second version, or replica: although the title does not appear in O'Neill's account book. The motif of the flower vase on the table, a leaded window and embroidered chair is reminiscent of Sunday Afternoon, though the setting is a town house and not Old Willesley. Inscription: Signed verso: 'G.B. O'Neill 1867 No.2.